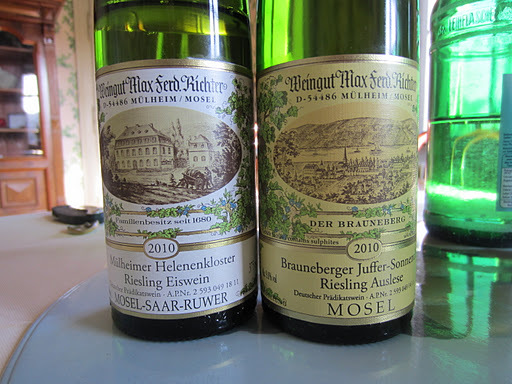 The wines from the Mulheimer Sonnenlay vineyard, which is a monopol owned exclusively by the estate, are more vibrant fresh and zingy in their acidity. The Brauneberger wines tend to be more concentrated and subtle, with distinct minerality coming from the brown slate soil. Moving up through the quality and sweetness scale, the wines began to exhibit some elderberry and tropical fruit characteristics with nice delicate viscosity to coat the mouth. The Veldenzer Elisenberg wines contribute a further element of spice and herbs to them. We finished with an Eiswine from 2010 (there will be no Eiswine from the 2011 vintage as the first frosts for winter only happened this week), which was extremely concentrated and syrupy, but having great acidity carries the flavours across the palate beautifully.